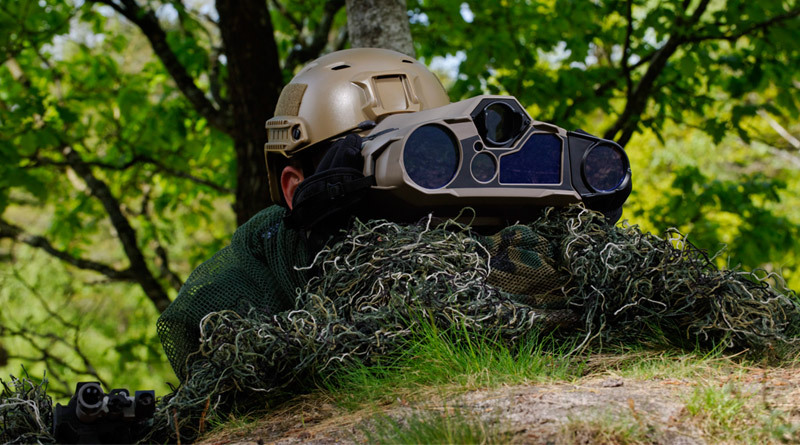 Representing the new generation of 4-in-1 thermal imaging devices for dismounted soldiers, the Sophie Ultima combines tactical binoculars, an infrared target locator, a daytime laser range finder and a teleconverter into a single piece of equipment, significantly reducing size and weight while delivering even higher performance. The new imaging device weighs only 2.5 kg and meets the need to progressively reduce the weight of the equipment deployed by armed forces. Making target identification possible over long distances, the Sophia Ultima device provides significant tactical advantages at night. Sophie Ultima can also provide tactical advantages in daytime operations. It combines a high-performance glass day channel with the detection capabilities of infrared imaging. This device can detect body heat signatures at ranges exceeding 1 km. This kind of technology can allow soldiers to de-camouflage potential enemy soldiers who would otherwise be invisible to the naked eye. Thales proposes a thermal imager with expanded functionality and augmented performance with the Sophie Ultima. Not only does this enable the device to deliver the benefits of collaborative combat like augmented reality, it also helps soldiers in detecting threats sooner which in turn allows for faster engagement. As a result, strikes are safer, faster, and more precise. Sophie Ultima is a fully modular system that accounts for future operational requirements and technologies. It does this by employing the new “eXtension” concept with a plethora of plug-and-play accessories for future upgrades. Thanks to its common user interfaces and shared maintenance solutions, the Sophie Ultima offers a significantly reduced instruction, training, and support footprint. It also ensures that suitable equipment is available for specific tasks and missions. This new generation of imaging devices will meet the operational needs of all the units, from squadron leaders to the Special Forces. Thales has sold 15,000 Sophie thermal imagers in 55 countries in the recent years. “The armed forces rely on Thales for its expertise in the connectivity, big data, artificial intelligence and cybersecurity technologies that are key to their digital transformation. With Sophie Ultima, the soldier of the future will master the art of collaborative combat day and night,” Vice President, Optronics, Thales, Jean-Pascal Arrou-Vignod.